Whether you are looking to buy, sell or lease an aircraft, Meridian Helicopters (a subsidiary of Cadorath) has the solution that your operation requires. Supported by decades of experience and training our professionals are committed to provide the guidance and assurances customers demand when buying or selling an aircraft. Our extensive marketing and research ensures that the optimal buyer and seller are matched in every transaction. We provide aircraft fair market valuations, market research conditions, as well as financing and insurance consultation. Our TCCA/FAA/EASA approved maintenance services include dynamic component repair and overhaul, aircraft refurbishment, pre-buy inspections, and mission completions by our factory trained technicians. When a leasing solution is preferred to an aircraft purchase, we can provide tailored conditions that suit every requirement. From VIP completions to specific mission utility configurations your aircraft is delivered exactly to your specifications. You will also find our lease agreements are flexible and accommodating regarding lease term, monthly & hourly rates, and options to purchase. We also provide complete support solutions with all engine, dynamic component, and airworthiness limited items built into our lease services. Our completion and leasing services provide the mission ready helicopter that your operation requires. 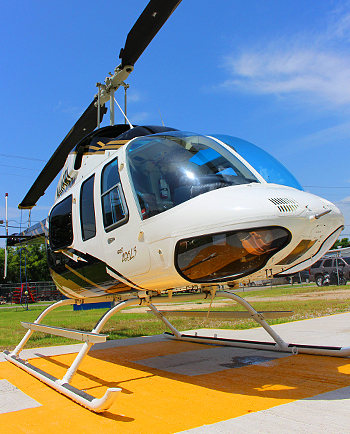 This “like new” utility configured Bell 206L4 has been completely refurbished and is available for immediate sale or lease. The aircraft features TSO 0.0 engine, MR hub, TR gearbox and swashplate with total in excess of 85% time remaining on the engine and components.